After the initial inspection flight Saturday morning, it was determined that the center received some isolated roof damage, damaged support buildings, a few downed power lines, and limited water intrusion. Since safety is our utmost concern, teams of inspectors are going from building-to-building assessing damage. Due to the complexity of this effort, teams need time to thoroughly inspect all buildings and roads prior to opening the Kennedy Space Center for regular business operations. Not until after a full inspection of the center will a list of damaged buildings and equipment be available. The next update will be available no earlier than Sunday afternoon. The wind conditions at Kennedy Space Center have dropped below 40 knots and preliminary damage assessments are under way. KSC is now in a “Weather Safe” condition as of 2 p.m. Friday. 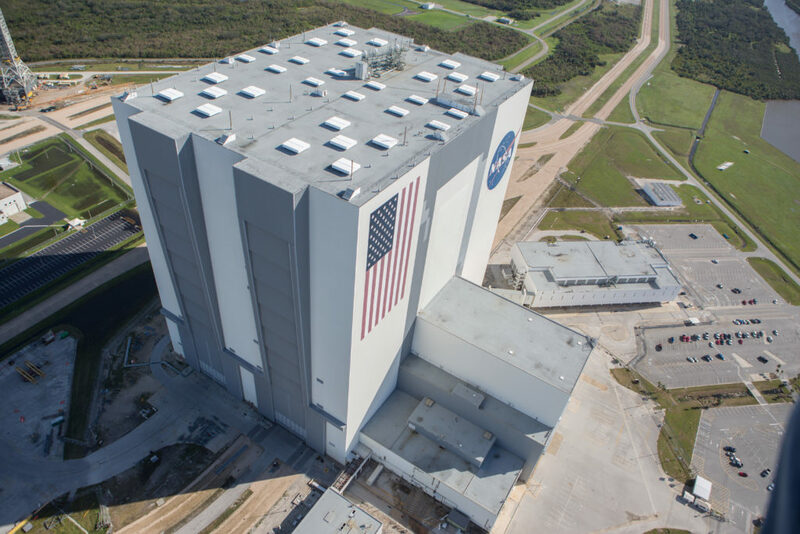 While there is damage to numerous facilities at KSC, it consists largely roof damage, window damage, water intrusion, damage to modular buildings and to building siding. There does not appear to be damage to flight hardware at this time. The Damage Assessment and Recovery team will undertake more detailed inspection on Saturday and will enter all facilities. The Kennedy Space Center Visitor Complex will be closed on Saturday and will reopen on Sunday. Based on the damage assessment, the return to work status for KSC employees will be determined Saturday afternoon. 9:45 a.m. EDT – Hurricane Matthew has now passed offshore from Cape Canaveral and is north of Kennedy Space Center. The wind is starting to decline but remains near tropical storm strength. However, until the wind is consistently below 50 knots a crew cannot be sent outside to begin a more thorough look at KSC. That is expected sometime this afternoon. At this time there is observed to be limited roof damage to KSC facilities, water and electrical utilities services have been disrupted and there is scattered debris. Storm surge has been observed to be relatively minimal, limited to localized portions of the space center. The Damage Assessment and Recovery Team will be brought in for its formal assessment Saturday morning. Hurricane Matthew is passing Cape Canaveral and Kennedy Space Center at this time with sustained winds of 90 mph with gusts to 107 mph. There are no reports of significant damage so far, mostly power outages around different parts of the space center. The storm is expected to have passed the space center by 10:30 a.m. Tropical storm force winds are expected to continue until about 9:30 tonight. The storm is passing the space center about 26 miles off the tip of Cape Canaveral. Rainfall totals for the hurricane by the end of the storm are forecast to be 8-12 inches. Storm surge models are somewhat lower than originally forecast, now from 1-5 feet in various locations. The hurricane ride-out crew at Kennedy Space Center team is beginning its report to stations to prepare for Hurricane Matthew. The number of ride out crew members has been adjusted slightly to 116. All facilities at Kennedy Space Center and Cape Canaveral Air Force Station have been secured. The most recent weather briefing shows tropical storm force winds beginning at Cape Canaveral tonight at midnight with hurricane force winds starting at starting about 6 a.m. The wind is expected to decline at approximately 4 p.m Friday and fall below tropical storm force early Saturday morning. Under the current storm track, peak winds are forecast to be 125 mph sustained with gusts to 150 mph, however a shift in the track even slightly could improve the wind forecast somewhat. The Kennedy Space Center is closed today, Oct. 6, and Friday for Hurricane Matthew. Kennedy Space Center is now in HurrCon 1 status, meaning a hurricane is imminent. Hurricane preparations at Kennedy were completed early last night, and remaining employees were then sent home. A final check is being made this morning around the space center for any potential loose debris. The hurricane ride-out team will report for duty at 3 p.m. today in the major buildings and facilities at KSC. 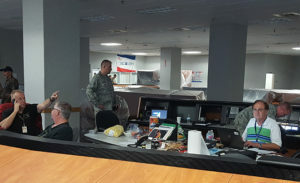 During the storm they will report any significant events to the Emergency Operations Center, located in the Launch Control Center at Complex 39. They can also take any action needed to stabilize the situation and keep the facility secure. There will be 139 people on the ride-out team at locations around KSC. After the hurricane has passed and winds have dropped below 50 knots (approximately 58 mph), damage around the space center will be assessed and the Damage Assessment and Recovery Team will then report for duty. Tropical storm force winds are expected at Kennedy Space Center and Cape Canaveral late this evening followed by hurricane force winds early Friday morning. NASA’s Kennedy Space Center in Florida is closing at 1 p.m. EDT today, Wednesday, Oct. 5, due to the approach of Hurricane Matthew. Across the spaceport, essential personnel are preparing facilities for the storm’s arrival. Hurricane Matthew is expected to make its closest approach to the Cape Canaveral/Kennedy area overnight Thursday and into Friday morning, bringing with it the potential for heavy rain, storm surge and hurricane-force winds. Once the storm has passed, center facilities and infrastructure will be assessed and employees will be cleared to return when it is safe to do so. Kennedy Space Center Visitor Complex will be closed on Thursday, October 6 and Friday, October 7. Visitor Complex officials anticipate reopening Saturday, Oct. 8 at 9 a.m. after a thorough assessment of the property has been completed. An integrated test of the MARCO POLO/Mars Pathfinder in-situ resource utilization, or ISRU, system recently took place at NASA’s Kennedy Space Center in Florida. Demonstrations such as this one help scientists learn how to extract critical resources on site – even as far away as the Red Planet. 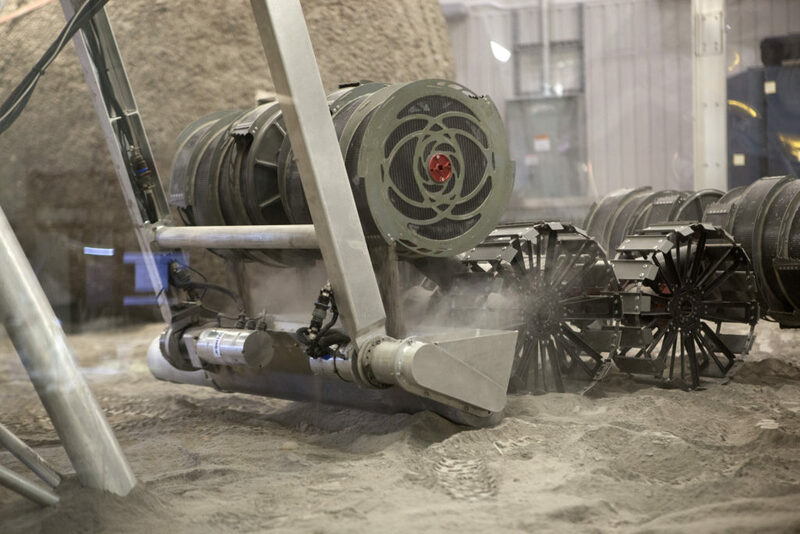 A mockup of MARCO POLO, an ISRU propellant production technology demonstration simulated mission, was tested in a regolith bin with RASSOR 2.0, the Regolith Advanced Surface Systems Operations Robot. RASSOR excavated regolith and delivered sand and gravel to a hopper and mock oven. On the surface of Mars, mining robots like RASSOR will dig down into the regolith and take the material to a processing plant where usable elements such as hydrogen, oxygen and water can be extracted for life support systems. Regolith also shows promise for both construction and creating elements for rocket fuel.